The Turkey is a symbol of forest abundance and Gaia’s ever-loving support for humans in the wild. Sacred to the Navajo and many eastern tribes, the turkey helped to make the earth and brought corn in many traditions. Turkey feathers figured prominently in cloaks and headdresses of many native cultures of the Americas. In one myth, the turkey as “Peace Eagle” was sent with the light of the stars to sustain humans on earth in a time of great need, and to teach them respect. A well-timed gift for us as well now. The turkey is a large ground bird sacred across the Americas. The turkey’s shape implies the great cosmic egg. They move in flocks across the forest floor, adaptable omnivores, they live easily off of the bounty of grubs and insects of this web of life.The turkey is quick, alert, and adaptable, as are those with a turkey totem. You may look at bit awkward in your movements, but you are more than capable when a need arises. Turkeys roost together and find strength in groups. 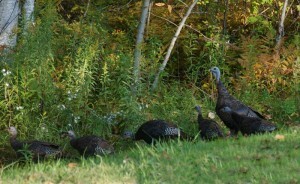 Abundance is coming your way if the turkey crosses your path. You also may be the magnet which attracts abundance to your circles, or one who sacrifices themselves for a greater good. The appearance of the turkey may also indicate a need to transcend the personal and assist a greater collective. It is equally possible that you are about to receive a gift. The message from the “Peace Eagle” was indeed, respect, but also: “Appreciate everything in your life, that my body brings to your day. All has purpose. There is only The One That Is All Things. Do not waver from your word. Hold your word as valuable as your next breath”. So says the turkey to us now. Totem note: It is always helpful to count the animals you see, take a mental note on if they are babies or adults, which direction they are moving in. I tend to interpret left movement as receptive or passive, and right movement as projective or active. For me, a yes answer could come from either direction, if a question or thought is active on my mind at the moment of contact with the animal.